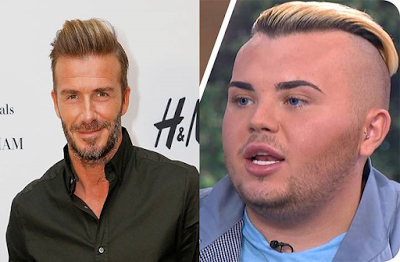 An unemployed 19-year-old British man, Jack Johnson, says he has spent £20,000 (about $26,000) of Benefits money, on surgery to look like soccer star David Beckham. Johnson says he spent the money on procedures for his cheeks, chin, eyebrows, lips, teeth and tanning injections to try to look like Beckham. He says even though he knows he doesn't yet look like Beckham, it will cost him another £30,000 in procedures to help him reach his goal. Johnson who admits to being in a lot of debt says Doctors have shot down some of his requests.